Higgs boson decaying into two Z bosons each of which subsequently decays into two muons (red lines). Higgs boson decaying into two photons (yellow cones). Higgs boson decaying into two W bosons, where one W decays into two jets (yellow cones) and the other one into a muon (red line) and a muon neutrino (yellow dashed line). 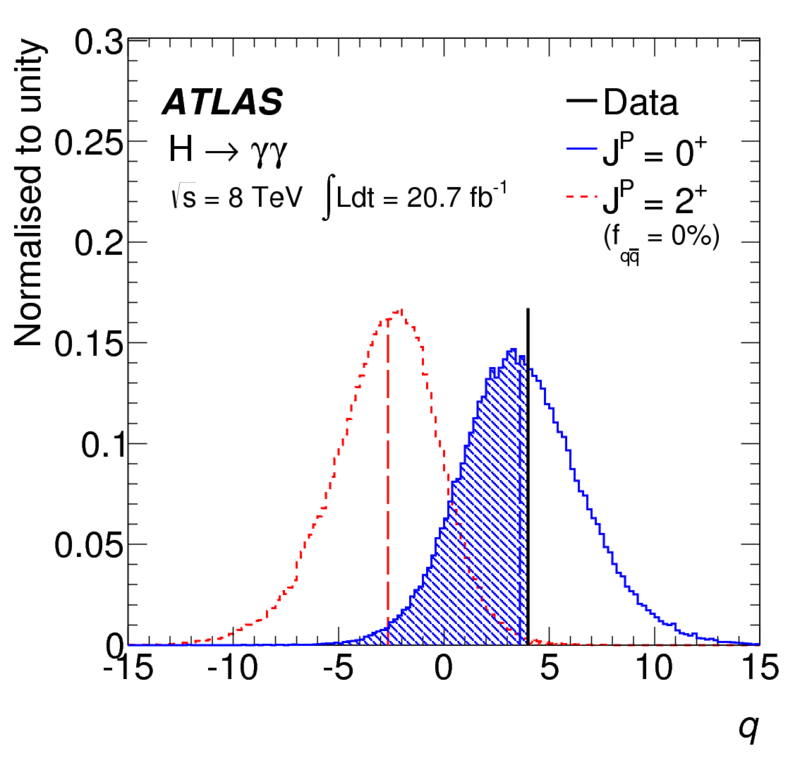 Higgs boson decaying into two τs, each of which subsequently decay into either an electron (blue line) or a muon (red line). Hi resolution Higgs boson decaying into two photons (yellow cones). 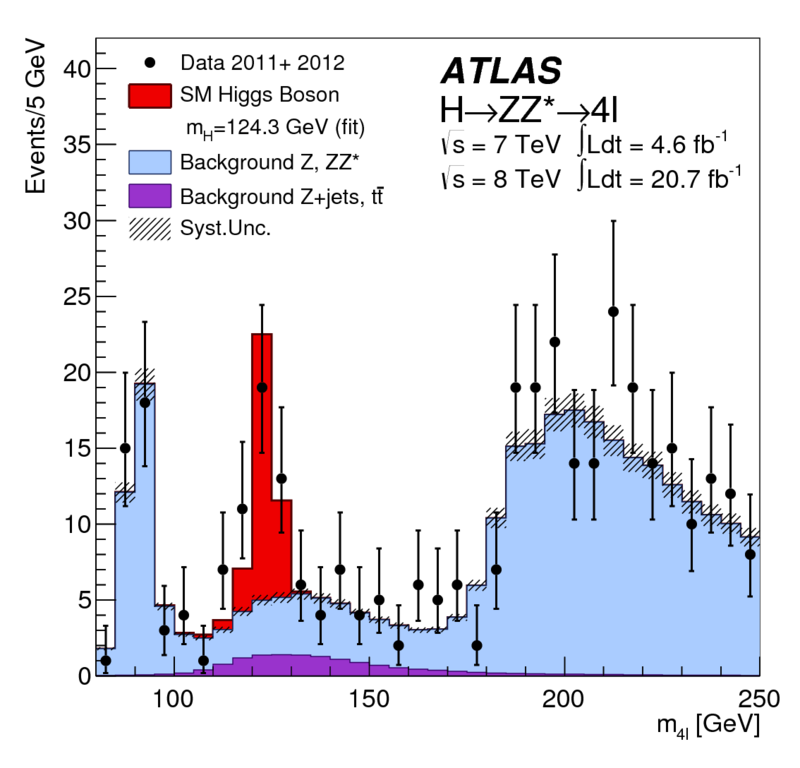 Hi resolution Higgs boson decaying into two Z bosons each of which subsequently decays into two muons (red lines). More Higgs event displays here! Our current situation. Having analyzed two and a half times more data than was available for the discovery announcement in July 2012, the confidence of observation, looking for a Higgs boson decaying into two photons and into two Z bosons has risen to 10 sigma. We also now see evidence for the Higgs boson decaying into two W bosons and into two τs (fermions). Higgs boson decaying into two Z bosons each of which subsequently decays into two muons. Download Higgs boson decaying into two Z bosons each of which subsequently decays into two muons. Download Higgs boson decaying into two photons. Download Higgs boson decaying into two W bosons. Download Higgs boson decaying into two τs. 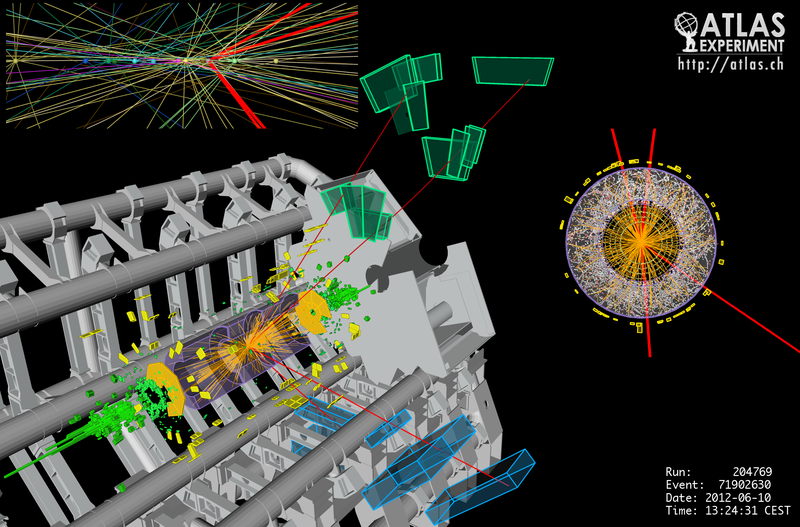 Time lapse showing how we discovered the Higgs boson. Download Higgs boson decaying into four leptons. Download Higgs boson decaying into two W bosons, where one W decays into two jets (yellow cones) and the other one into a muon (red line) and a muon neutrino (yellow dashed line). 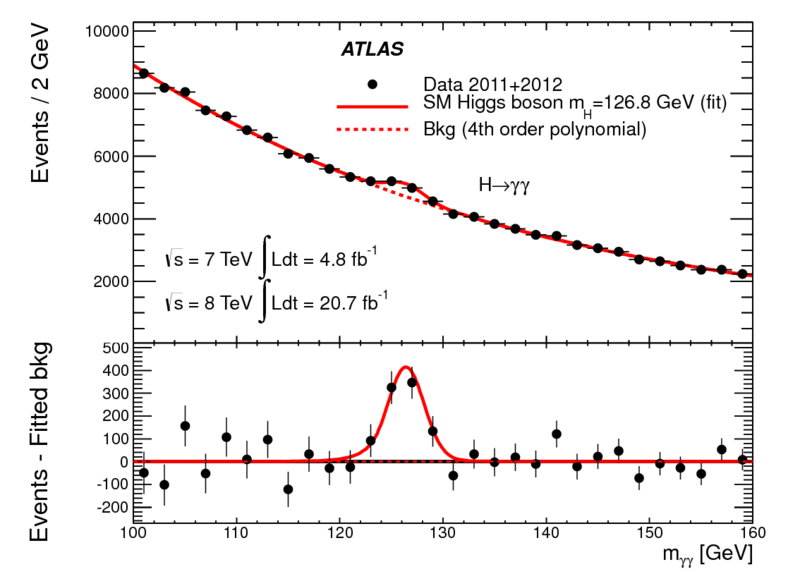 Download Higgs boson decaying into two τs, each of which subsequently decay into either an electron (blue line) or a muon (red line). One example of evidence that the discovered boson is indeed a Higgs boson, which is expected to have spin J=0 and parity P+. The properties of the new particle, as well as the ways it interacts with other particles, were found to be well-matched with those of a Higgs boson. One example illustrating that the data look more like a spin-0 particle (like a Higgs boson) than one with a different spin (spin-2). Download One example illustrating that the data look more like a spin-0 particle (like a Higgs boson) than one with a different spin (spin-2). 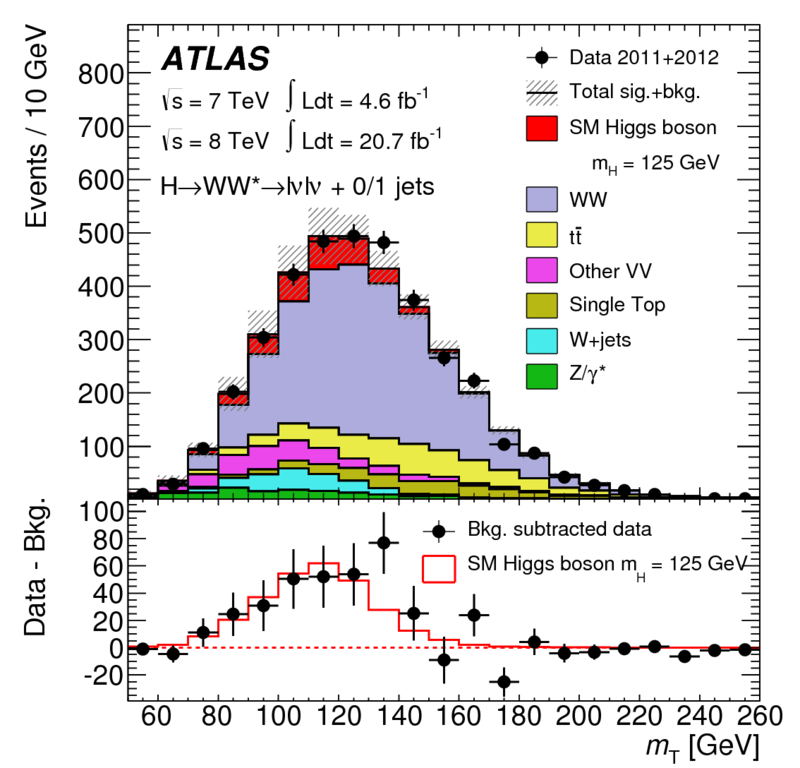 All ATLAS Higgs results here. 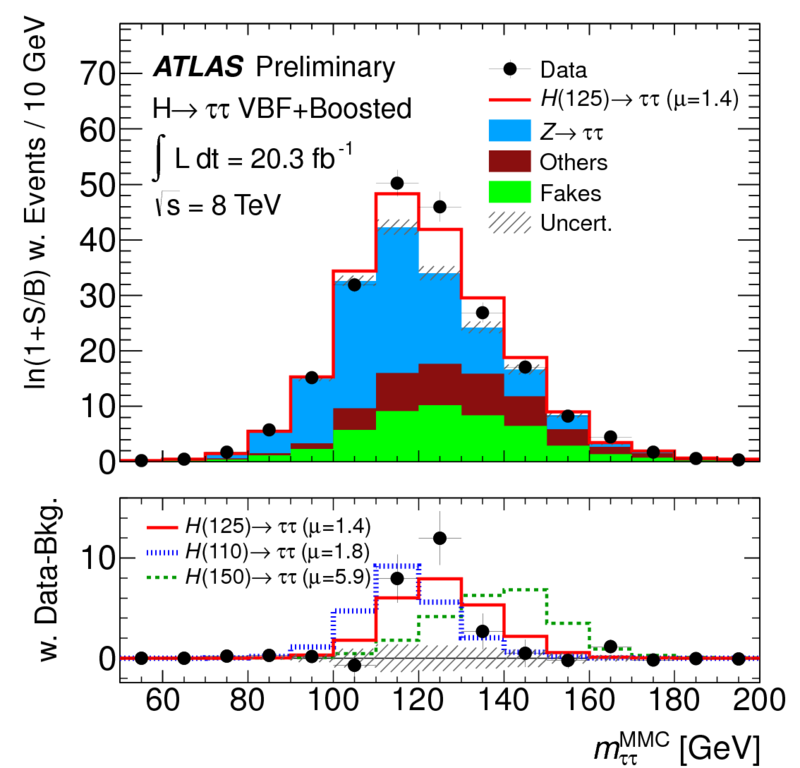 Explanation of the ATLAS Higgs boson exclusion plots here. Peter Higgs in the ATLAS cavern. François Englert in the ATLAS cavern. Poster targeted to general public, explaining the Brout-Englert-Higgs mechanism and why it is important. It also explains the role of the Higgs Boson, how we look for it, the journey of the discovery and what comes after the discovery. Available in English and French (Size A0).